- what is the flooring made of? Beautiful!!! Can you tell me the corner radius of island counter? softened edge or is that a 1 inch radius? Thanks! The radius is 1 1/2". - Hi, how high is the ceiling? 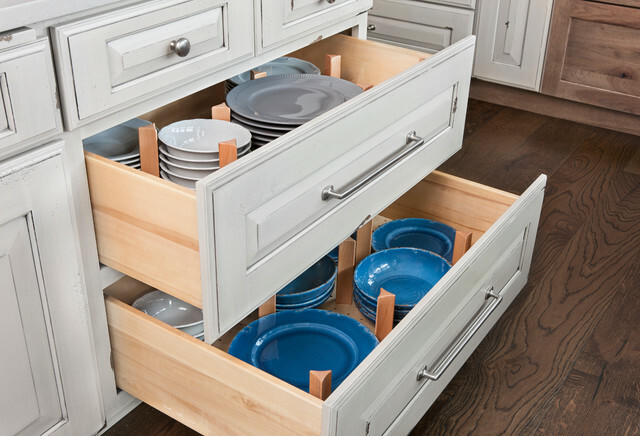 The stacked cabinetry "look" would be challenging with an 8 foot ceiling. 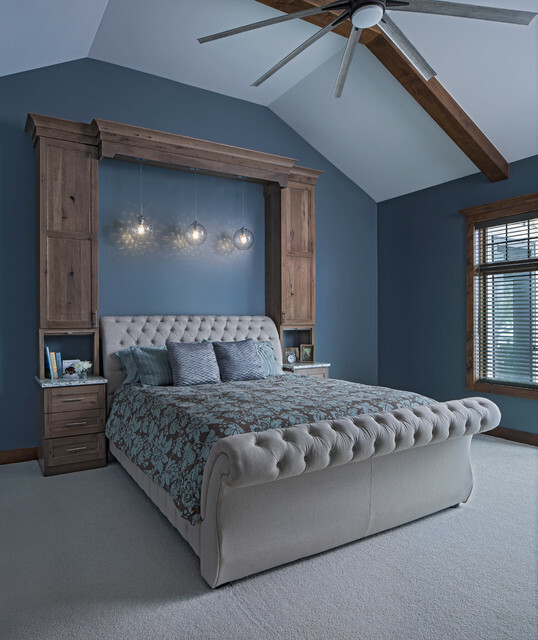 When working with an 8 foot ceiling you have a couple options: use 36" upper cabinetry and add molding to top or work with 42" upper cabinetry and have one thin piece of trim at top. If you decided to consider custom sizes, the proportions may appear short and thickset for the room. What is the size of the kitchen? Hello marcgoracke, thank you for asking. The cabinetry for the island is 108" x 50.75". 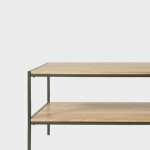 The countertop has a 1.5" overhang bringing the overall island measurements to 111" x 53.75". The seating area provides 15" of knee room. I love the backsplash. Can you tell me where you got it? - I love the layout of this wall cabinetry. I have 10.5' of wall space and I'm wondering if this layout would work. Can you tell me the overall width of the wall cabinets/refrigerator? Thanks in advance! The backsplash is Ledgestone Quartzite. 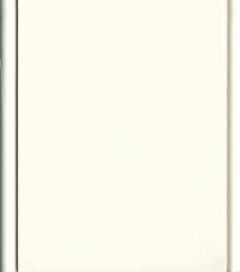 The name of the color will vary by manufacturer, here is an example. Golden-Honey-Ledger-Panels. Dimension of island and is the dishwasher in the island? Thanks! 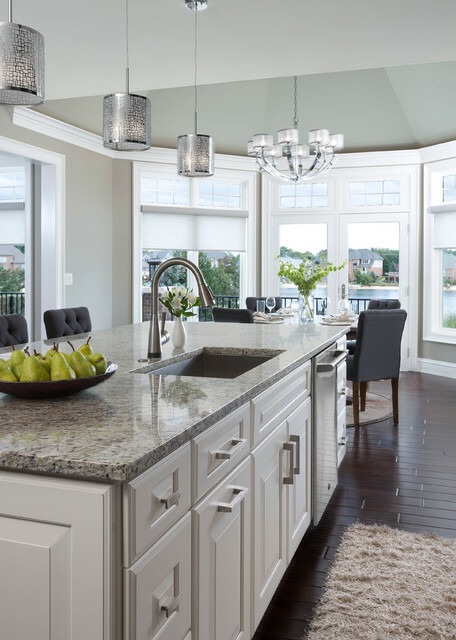 how much does the counter top overhang on the island? What Gray did you use? It's just what I'm looking for. insolitary, thank you for asking. The walls are SW 7503 "Sticks & Stones" from Sherwin-Willaims. - Can you please tell me about the cabinet hardware. I love it! Target offers them different heights and colors, as you can see the "dinning room" chair off to the left side. These target chairs look nice and are a great price! Best of Luck! - What is the size of the kitchen? You're welcome! Hope this information helps. Please give me information on the backsplash I really like it. This Quartzite stone can be used for the interior or exterior, therefore it does not necessarily need to be sealed but a stone sealer will make it easier to clean. It is recommended to use a stone cleaner however. This product can be purchased at Virginia Tile, Beaver Tile or Home Depot and Lowe’s. Look for the brands Tile Lab or Aquamix. - Where are the pendant lights from? Thanks! Hello Jerry. This is Knob Hill Birch Hand-scraped flooring from Virginia Mill Works. - What kind of wood floor is this? Particulay the wood species and the stain?? Love the counter stool, where can i find them? That is correct. Thank you Mandi! You're welcome. Glad I was able to help. 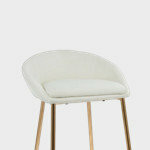 - Do you have the info (name and source) of the bar stools? - What color wall paint is this? - Can you tell me the paint color of the cabinets? Thank you for answering this question for us Michelle. You're welcome. I'm glad I was able to help. What color paint is used here? Thank you Michelle. You are correct, the walls are SW 7503 "Sticks & Stones". It looks fantastic with the cabinetry finish. - Who is the manufacturer and what is the model of the range hood? Hello jwsshort! Dura Supreme Cabinetry is correct, this is a GE Monogram range hood Model ZV800SJSS. Thank you for asking. 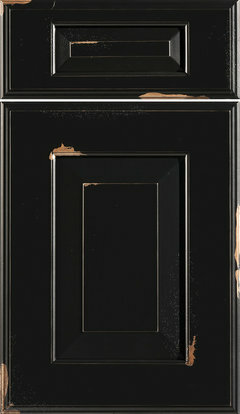 Simpson Doors carry that style door with a variety of finishes and glass options. The door was selected by our client outside of our design and services. We will keep you all updated on any information we may obtain. I like the hood also but I just looked up the model number and a different picture pops up. Are you sure that is the right number? - Hi can you please tell me what the counters are? Thank you! - What is the countertop? Granite, quartz? Style name? what is the counter top name? Hello jamielinam! This granite countertop is Santa Cecilia. - What type and color are the cabinets? 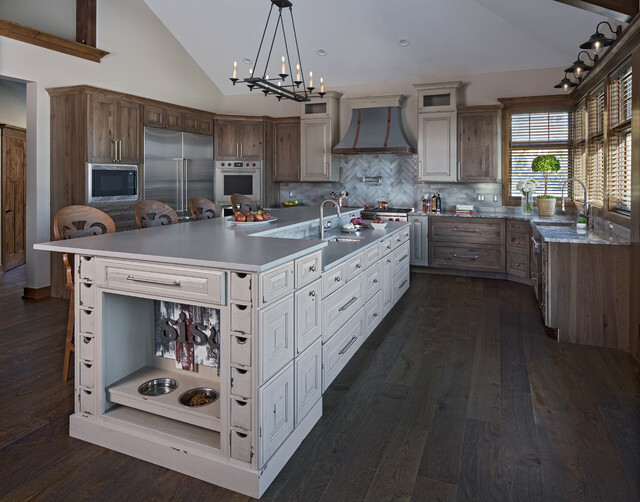 The island is from Dura Supreme Cabinetry, Bella Classic in White Rub and measures 108" by 50 3/4". - What is the brand/style/color of the backsplash? Hello Jaime, thank you for asking. Our client had acquired the backsplash outside of our design services. We do not have the specific brand for it, however we do know that the backsplash is Ledgestone Quartzite. We hope this helps. - What is the height between the range and the range hood ? Hello cmwolfskill, thank you for asking. The range hood is 30" above the range in this kitchen. 30" to 36" is the standard distance between the two. Hello lakinya. The cabinets are from Dura Supreme Cabinetry. Bella Maple door style in Graphite Rub for the perimeter and Bella Classic White Rub for the island. Thank you for asking. - Could you tell me who is the manufacturer, and white type of glass is in the panels? Thank you! Hello Alexis, thank you for asking. The door was selected by our client outside of our design and services. However, this door appears to be very similar. 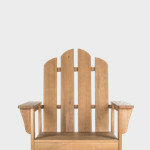 It is available for purchase through Houzz. It appears to have frosted glass. Are there electrical outlets in the island...if so, where are they? Hello Ginny, thank you for asking. The electrical outlets are located on the side of the island that is not shown along with the dishwasher. Who makes the vent hood? Love it! Hello katrinka000, thank you for asking. This is a 36" GE Monogram hood. Hello adelgado1219, we are more than happy to share more details on this island for you. The countertop has a 1.5" overhang on three sides and the overhang at the seating area is 15". Hello ortizleonard1970, thank you for asking. Our client had acquired the countertop and backsplash outside of our services. We do not have the specific brand for each, however the countertop is Santa Cecilia granite and the backsplash is Ledgestone Quartzite. What is the height of the Island? What is the height of the chairs? Hello Rob, thank you for asking. The island is 36" tall including the countertop. The bar stools are 43" tall overall with the seat measuring 30" from the floor. What Paint Brand and Color are the Walls? Thank you for asking Jennifer. 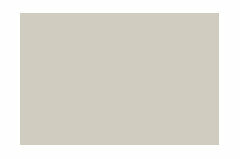 The wall color is SW 7503 "Sticks & Stones" from Sherwin-Williams. Hello matjasich80, thank you for asking. 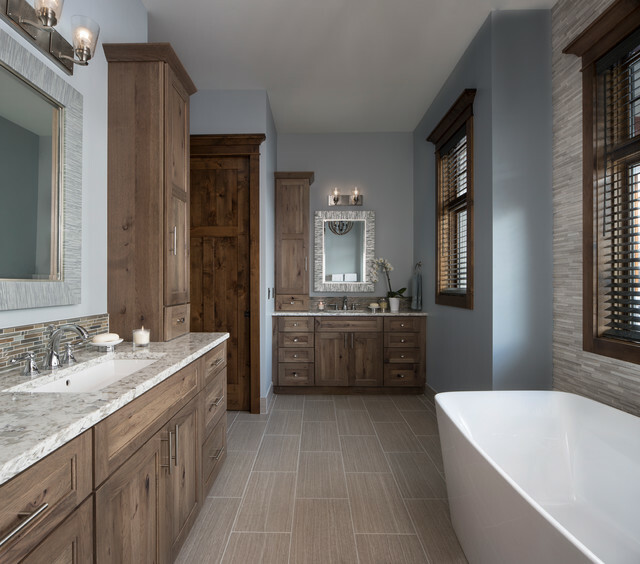 The cabinetry is from Dura Supreme Cabinetry. The door style is Bella Maple in Graphite Rub finish for the perimeter and Bella Classic in White Rub finish for the island. - How deep are the cabinets in front of the barstools? Hello Colleen, thank you for asking. The cabinets on this side of the island are 12" deep with the cabinets on the opposite side being 24" deep. Where is the microwave located? Hello rake38, thank you for asking. The microwave is actually located in the walk in pantry with the etched glass door to the right of the refrigerator. Hello sherrykw22, thank you for asking. The door was selected by our client outside of our design and services. However, this door appears to be very similar. 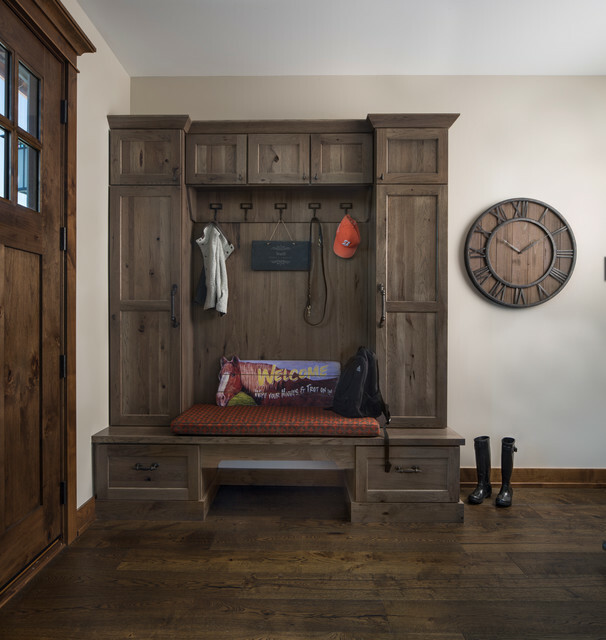 It is available for purchase through Houzz. - I was wondering where the stove is? Hello kylieriedl, the stove is located on the back wall below the hood and surrounded by the dark cabinets. Thank you for asking. - Can you tell me the brand and model of the range hood?? Hello islandsunny, this is a GE Monogram range hood Model ZV800SJSS. Thank you for asking. - who is the manufacturerand what is the type and color of the stone? Hello marisamelchiorre, thank you for asking. 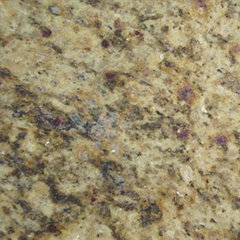 The color of this granite is Santa Cecilia. The brand pictured is unknown, however you can find its equivalent from most manufacturers. 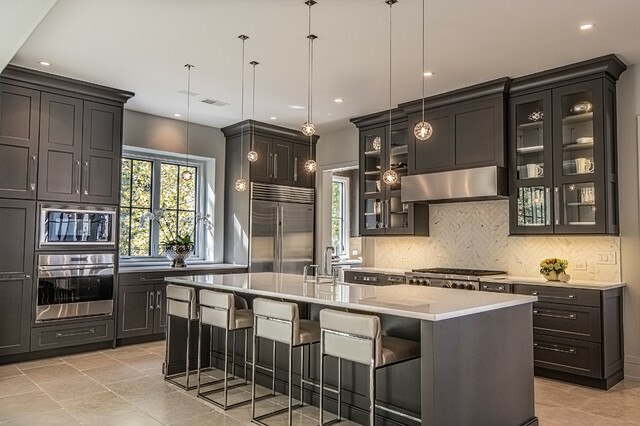 What paint color was used on the walls surrounding the dark cabinets? Hello jjoanie, thank you for asking. 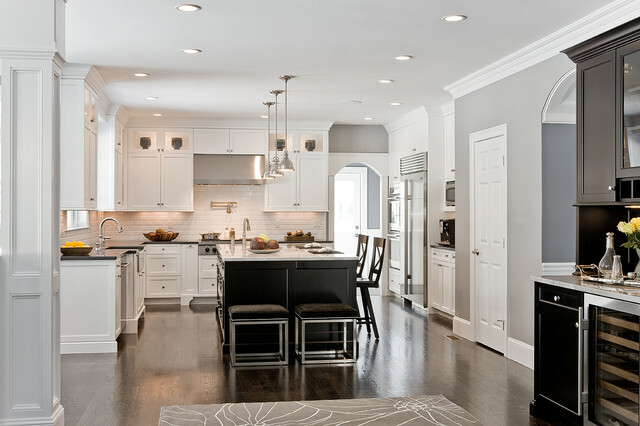 This kitchen's walls are painted in SW 7021 "Simple White" from Sherwin-Willaims. - How tall is the island?? Hello Patti, thank you for asking. With the countertop included, this island is 36" tall. - What is the ceiling height in this kitchen? Hello jurso2, thank you for asking. The ceiling in this kitchen is 9ft. Hello jenieve18, thank you for asking. You are correct, this is a granite countertop. Santa Cecilia is the name of the color. The brand pictured is unknown, however you can find its equivalent from most manufacturers. 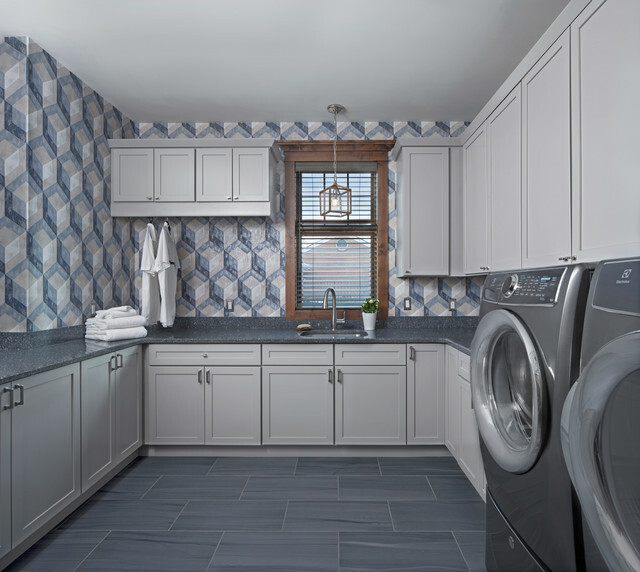 What specific quartzite ledgestone is the backsplash? 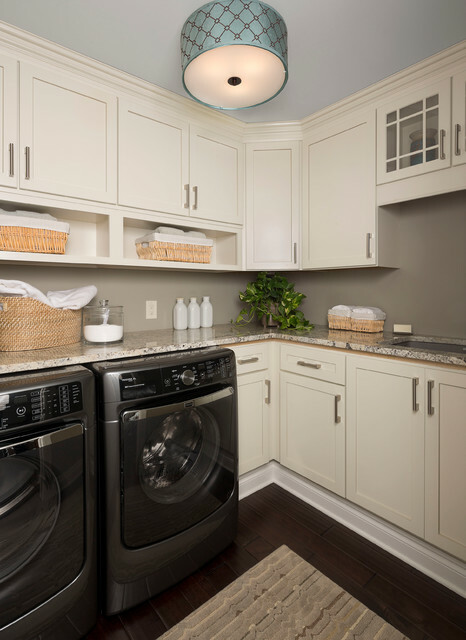 Where are the electrical outlets for an appliance and the disposal? - Can you put them on the side panels? - What is the ceiling height, 9 or 10ft? Hello tarshell, thank you for asking. The ceiling in this kitchen is 9ft. Hello mauied! This is Ledgestone Quartzite in the backsplash. Thank you for asking. - Thank you so much for the answer for the pendant lights. I really like them. My island is smaller though my contractor insists that I will be able to fit 3 chairs. In your professional opinion, will these particular pendants, if I order 3, be too many for an island 88" x 48"? Thank you! Hello christiemg, a very thoughtful question indeed. This island runs just over 108" long. Your island isn't too much smaller than that. 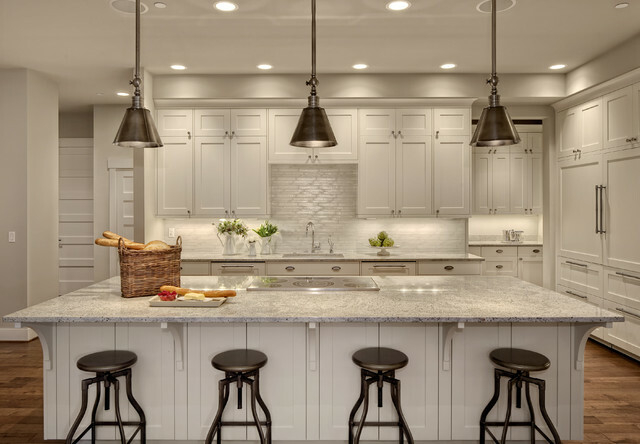 Assuming your pendant lights are to be designated lighting for the island area only, you could fit them in using at least 22" of space on each end of the island and space the apart from each other accordingly. If you were needing to light your entire kitchen space with them, you may want to space them out further. Thank you for asking. - I love this kitchen! What is the size of the cabinets on both sides of the range? 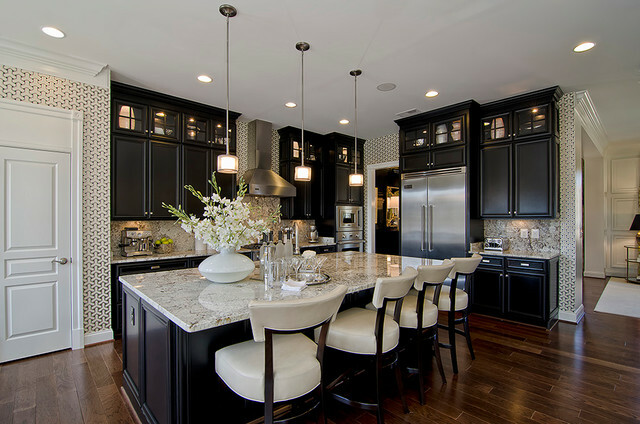 And what is the distance from the main dark cabinets to the island? Hello erinrn77, thank you for asking. The cabinets on each side of the range are 24" wide. There is approximately 48" between the perimeter cabinetry and the island. - Please let me know where they were purchased. Thank you! from Target are very similar as well. The Abbyson Living Collection bar stools are very similar to the ones in the photo, I found an image on Houzz shown below... I hope this helps. - I love the pendent lights above the island. Can you please tell me where they're from? Thank you! Hello chrstiemg! These lights are from Elk Lighting, Medina 1-Light Pendant in Polished Stainless Steel. You can find them here: http://www.elklighting.com/eSource/Medina_1-Light_Pendant_in_Polished_Stainless_Steel/i_00/Elk_31041/1.aspx Thank you for asking. The wall paint or the cabinetry paint? 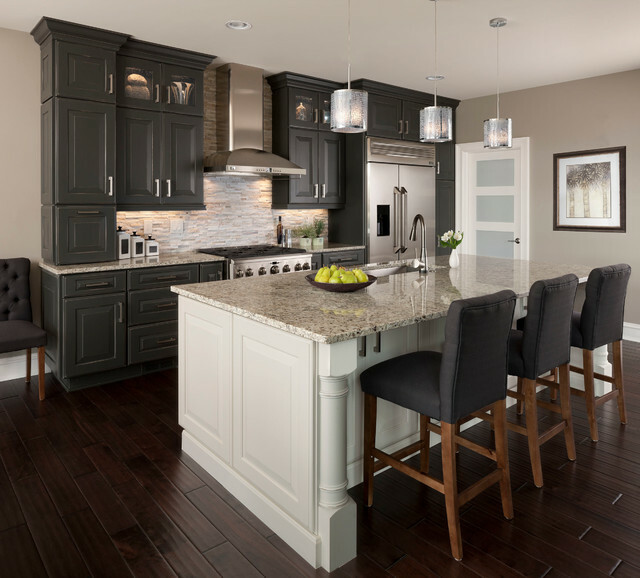 The cabinetry paint is shown in Dura Supreme's "Graphite" gray paint and the kitchen island is shown in Dura Supreme's "Classic White" paint with "Platinum" glaze finish. Hello marcandjen, thank you for asking, and thank you Dura for sharing the cabinet colors. 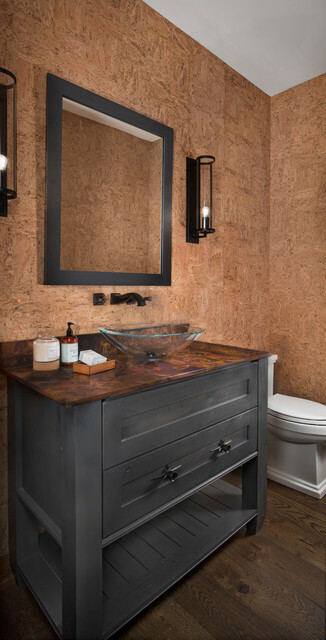 The walls are SW 7503 "Sticks & Stones" from Sherwin-Williams. - Is the dishwasher in the island? Hello michelinev, yes the dishwasher is inside the island. Thank you for asking. - Is this a 2cm countertop? Hello chickievan, thank you for asking. The granite countertop in this kitchen is 3cm. Great chairs- where are they from? - Hi can you tell me where you got the chairs for the island. i'm having a hard time finding narrow one with back that are about 26" high for my island. Our client had purchased the stools outside of our services. 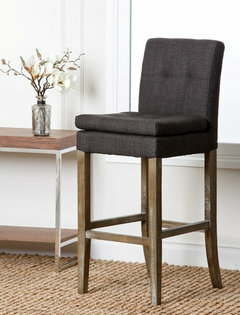 However, another Houzz user has suggested that these stools that are available from Target are very similar as well. What granite counter is it? Hello denisesavely, thank you for asking. This granite countertop is Santa Cecilia. What color is the backsplash? Hello ash28van! Dura Supreme Cabinetry is correct. 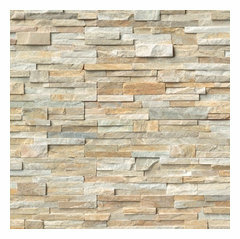 This is Quartzite Ledgestone. For proper cleaning and maintenance, it is recommended that Quartzite should be treated with a stone sealer. Hello Yolanda, Dura is pretty close. 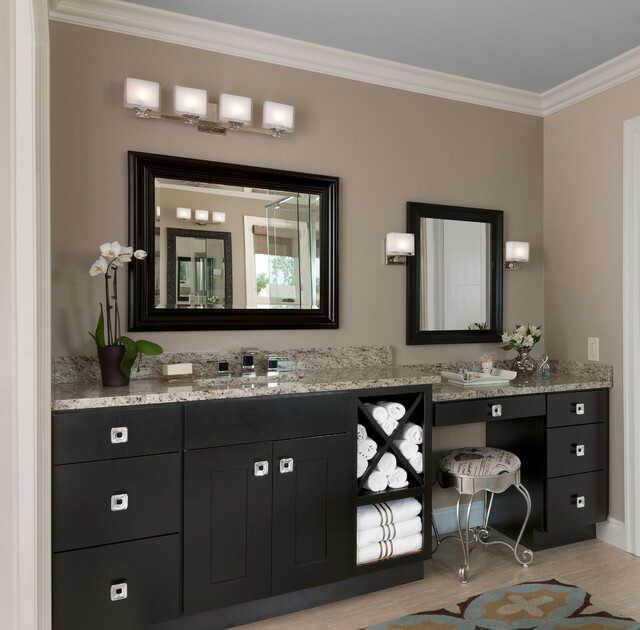 The walls are SW 7503 "Sticks & Stones" and the ceiling color is SW 7021 "Simple White" from Sherwin-Willaims. Thank you for asking. - what wall and cabinet color is this? 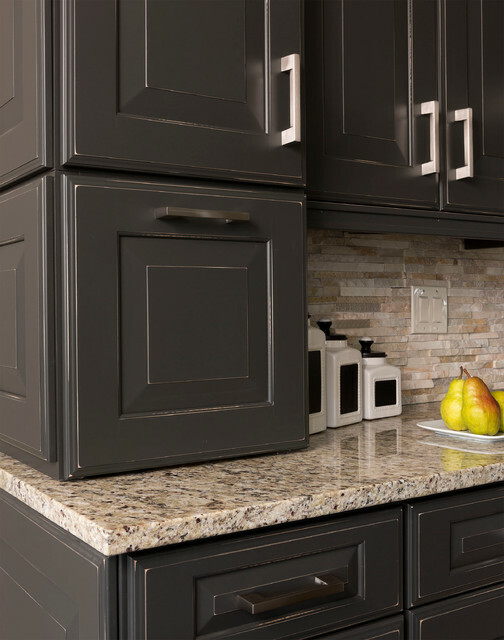 The outer cabinetry is Dura Supreme's "Graphite" paint finish. 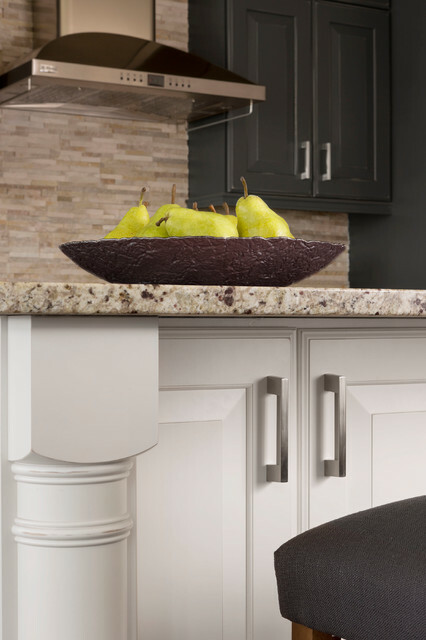 The kitchen island is Dura Supreme's "Classic White" paint finish. Thank you for the assist Mandi @ Dura! The walls are SW 7503 "Sticks & Stones" from Sherwin-Willaims. Thank you for asking. - I see that you have noted the dimensions of this island as 108 x 50-3/4. Can you please tell me what the seating overhang dimension is for the stools? Also, is 108 x 50.75 JUST the island size? If so, can you tell me please over overall countertop dimensions too? I really appreciate your help! Many thanks! Hello dawn510, we are more than happy to share more details on this island for you. The seating overhang is 15". The 108"x50.75" measurement is for the cabinetry only. The countertop has a 1.5" overhang bringing the overall island measurements to 111"x53.75". - Can you tell me the color of the floors and weather they are real hardwood or engineered. Hello Sarah, thank you for asking. This kitchen has Knob Hill Birch Hand-scraped flooring from Virginia Mill Works. What are the light pendants ? Hello samkateelisa! These lights are from Elk Lighting, Medina 1-Light Pendant in Polished Stainless Steel. You can find them here: http://www.elklighting.com/eSource/Medina_1-Light_Pendant_in_Polished_Stainless_Steel/i_0_0_/Elk_31041/1.aspx Thank you for asking. - Would you share the source of the bar stools? Thank you! Thank you countertopgirl, you may be correct. Our client had purchased these separately from our design and installation services. The stools in the link provided above appear to be very similar in the charcoal color. I love the whole room. Love the canisters too. Where can I find them? Hello perrilynn. These cannisters were purchased from Home Goods. Thank you for asking. - are the glazed too? Hello mflevin00. The rail and style is 3 7/16”. 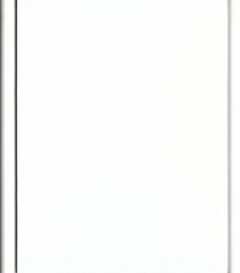 The glass inserts are approximately 12” x 12”. Hope that helps! Where do you get the lamps? - Where to buy the lamps? counter overhang, width & length of island cabinets and counter top. - could you please tell me the overhang if the counter top where the legs would comfortably fit and the overall dimensions of the island? thank you in advance. Hello jenntorp, great questions. The island is 108" long by 53 15/16" wide. It stands at 34 1/2" tall. 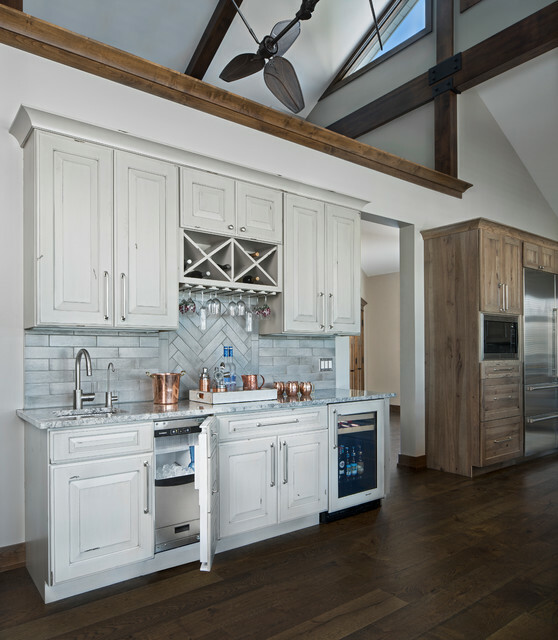 It is from Dura Supreme Cabinetry, Bella Classic in White Rub. what is a comfortable counter overhang for an adults legs when sitting at countertop? what is the name of the cabinets under island? Hello warrenka! 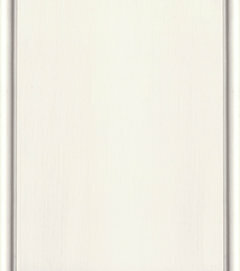 The doors on the island are Dura Supreme Bella in Classic White Rub. Thank you for asking. - Would you mind sharing the the brand/style of the cabinet pulls? 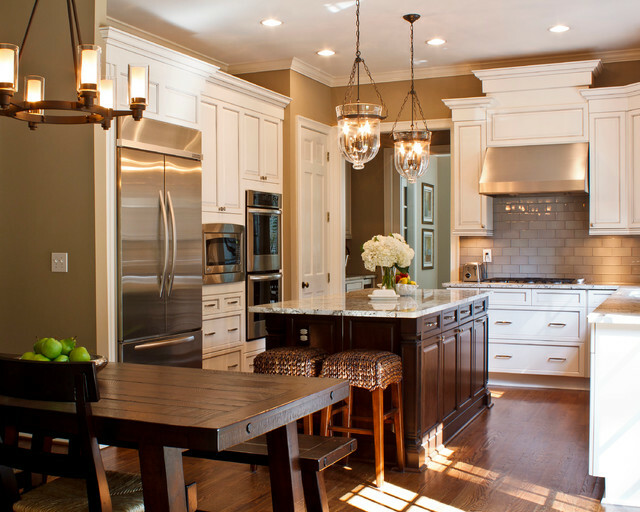 I love the modern profile with the traditional raised panel cabinets in the warm colors. Great look!!! Hello fredspeyer, thank you for asking. 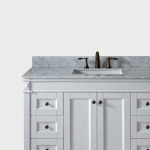 The handles and knobs were chosen outside of our design services by this client. The closest match that we can find to the hardware pictured is from Richelieu Hardware. 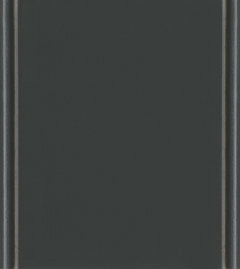 Transitional Metal Pull #795 - BP795128195. You can see them in more detail here. - What are the dimensions of the upper cabinets and glass cabinet on top? 30" and 18"? Hello Wendy, thank you for asking. Starting from the far left, the upper cabinets are 18" wide. The glass front cabinets next to the hood are custom built at 32" wide. Hope that helps! Far Left Wall Cabinet dimension? - Hi there - I love the look of the Wall cabinet sitting in the counter. Can you tell me the Depth of the far left cabinet? Is it considered a bathroom cabinet? Hello clearyam, thank you for asking. The far left upper cabinets are 15" deep. 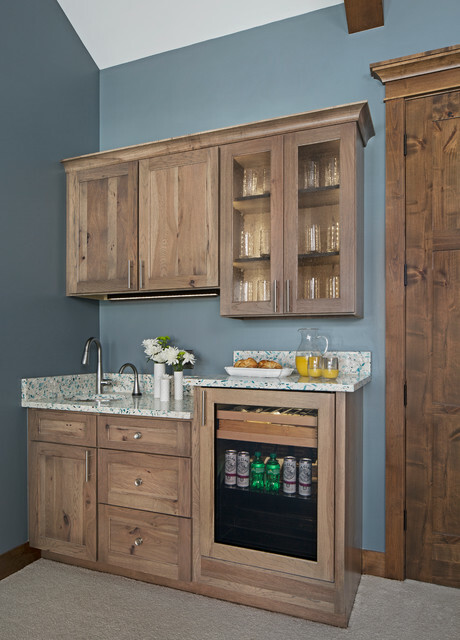 The bottom cabinet that rests on the countertop has a lift-up door which functions much like the fourth photo down in this example, http://www.durasupreme.com/storage-solutions/lift-storage#.U-o0UWMUx8F Our client uses this cabinet to store her mixer. - Hi would you mind sharing the dimensions of the island please? Hello ebonyivory, thank you for asking. The cabinetry for the island is 108"x50.75". The countertop has a 1.5" overhang bringing the overall island measurements to 111"x53.75". The seating area provides 15" of knee room. - Can you tell me the width of the cabinets on either side of the range? Hello Nellie, thank you for asking. The lower narrow cabinets directly next to each side of the range are 9" wide. - Are there two differs types of hardware used here or do they look different due to the lighting? in more detail here. Each door/drawer has the same pull, they appear different due to the mix of horizontal and vertical installation and the lighting. Thank you for asking. Hello dawnamahon, thank you for asking. Our client had purchased this backsplash outside of our design services. It is 6"x24" interlocking quartz, stacked ledger stone. The name of the color will depend on the manufacturer. We will let you know as soon as we can find this information for you. - do you have any information about the color stain used for the dark hardwood flooring? Hello Candace, this kitchen has Knob Hill Birch Hand-scraped flooring from Virginia Mill Works. You can read more about it here. Thank you for asking. - Do you know the Brand/model of the range hood? Love it. Thank you! Hello vateachermom, this is a GE Monogram range hood Model ZV800SJSS. Thank you for asking. - What size is the island? - What is the size of this island and is this there another sink in the kitchen? Hello diepd, thank you for asking. The cabinetry for the island is 108"x50.75". The countertop has a 1.5" overhang bringing the overall island measurements to 111"x53.75". The seating area provides 15" of knee room. This kitchen features one sink, located in the island as seen in the photo. - I see that the wall color is sticks and stones. We are thinking of using the same color, but I'm wondering what color you painted the ceiling? Hello plumskinny! The ceiling color is SW 7021 Simple White from Sherwin Williams. Thank you for asking. - We are considering 5" Birch Floors in our home. With 2 small children, we are concerned about the wear and tear as I'm reading it's not one of the hardest woods. Do you have any opinion on this? Thanks so much! Hello sshtulman. Speaking to yellow birch, it is 2% softer than red oak, which in the flooring industry is the standard that everything is judged against. The longevity of any floor really depends on care and maintenance. All hardwoods will ding, dent, and scratch. While it’s true that harder products are more resistant to damage they can still be damaged under the right conditions. You can ask for samples to get a better sense for how strong a certain wood species can be. Take a look at this webpage for even more insights, http://www.armstrong.com/flooring/hardwood-hardness-ratings.html Thank you for asking. - what's the model and brand of the cooktop / range? - What type of wood and stain? If they are brand name can you give the brand and name of this particular product? Hello Eric! This kitchen has Knob Hill Birch Hand-scraped flooring from Virginia Mill Works. Thank you for asking. - Love the natural rock backsplash! What kind of rock us it? Where do you get it? Hello dvorakk! The walls are SW 7503 "Sticks & Stones" from Sherwin-Willaims. Thank you for asking. Love the hood…Who makes it? Hello janeyschecter! This is a GE Monogram range hood Model ZV800SJSS. Thank you for asking. Love the kitchen, what color/wood is the Island? Thanks for your help. Hello Jasmin! The island is classic white painted on maple with rub through on the paint finish. Thank you for asking. Love the interior door with the frosted glass what company is it from? What type of glass is used in the upper cabinets? Hello dphilion2. The glass in the upper cabinets is seeded glass. Air bubbles give it that unique look. Hello nbecker77. The ceiling in this kitchen is 9ft. Thank you for asking. - I' m in the middle of a removal and looking for a range hood. Love this one! Please send the info. Thank you. Hello allanagoodyear. The hood is a GE Monogram model #ZV800SJSS. Thank you for asking! - Hi! Love the diversity in the backsplash. Would you mind sharing what it is? Thanks! Hello kcally! This is Ledgestone Quartzite in the backsplash. Thank you for asking. Hello lindamcguire! This granite is Santa Cecilia, thank you for asking. Can you share the wall color please? Hello vickeyp! The walls are SW 7503 "Sticks & Stones" from Sherwin-Willaims. Thank you for asking. - What colors are the cabinets? Stain or Paint? Thank you for asking Ronette. 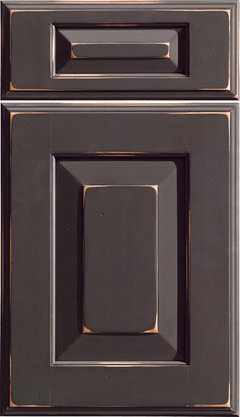 These doors are Dura Supreme Bella Maple with a Graphite paint finish. What color is the wood and is it Acacia Handscraped? - What color is the wood and is it Acacia Handscraped? This kitchen has Knob Hill Birch Hand-scraped flooring from Virginia Mill Works. Thank you for asking. I imagine our kitchen might look something like this with the cabinet colour we picked...is this too dark?